This week, the Federal Reserve talked up a chance for rate hikes this year while economic growth (as measured by GDP) has been in sharp decline over the last three quarters. Of the 363 companies reporting, we’re looking at a 3.2% plunge in earnings, that’s the 4th consecutive quarter in negative territory. Top line revenues were off 0.1% year over year. S&P 500 companies derive 40-45% of their sales outside the USA, as the dollar has surged over the last 18 month, it’s leaving a stain on earnings. 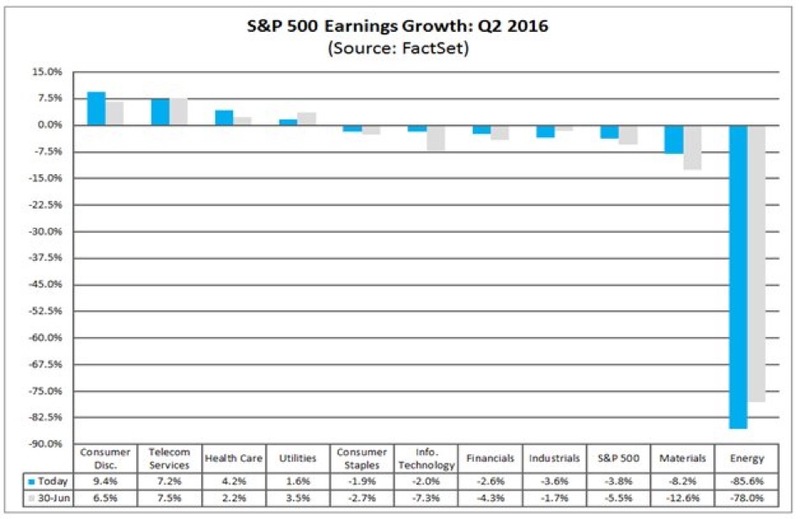 For Q3 2016, 36 companies have issued negative EPS guidance and 20 companies have issued positive EPS guidance. The global corporate earnings recession coupled with a sharp decline in GDP has ugly side effects. 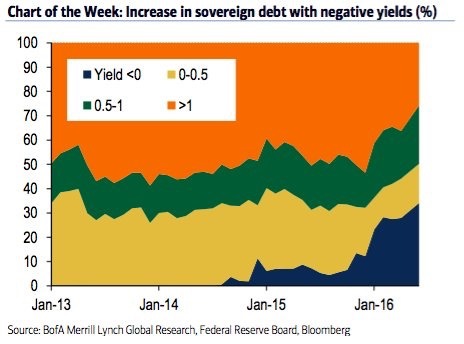 The percentage of government debt with more than a 1% yield has plunged from 61% to 31%, central bankers are forcing capital into places it just shouldn’t be. When actual GAAP earnings for the S&P 500 were stagnant from 2012 through 2016. But when companies used non-GAAP methods, earnings were up 14%, WSJ data shows. Fed’s 5 Year 5 Year Forward measures where investors expect inflation to be in the five-year period starting five years from today. As of Friday, the five-year, five-year stood at 1.39%, that’s down sharply from the 1.74% level the last time the Fed hiked rates. U.S. net domestic private business is off by 20% over the last 18 months. Publicly traded corporations seem more inclined to use low borrowing rates to pump debt into their balance sheets (through, say, share buybacks) than to invest in growth. The U.S. economy expanded less than forecasts in Q2 after a very soft start to the year. The results were much lower than previous estimates as companies slimmed down inventories. 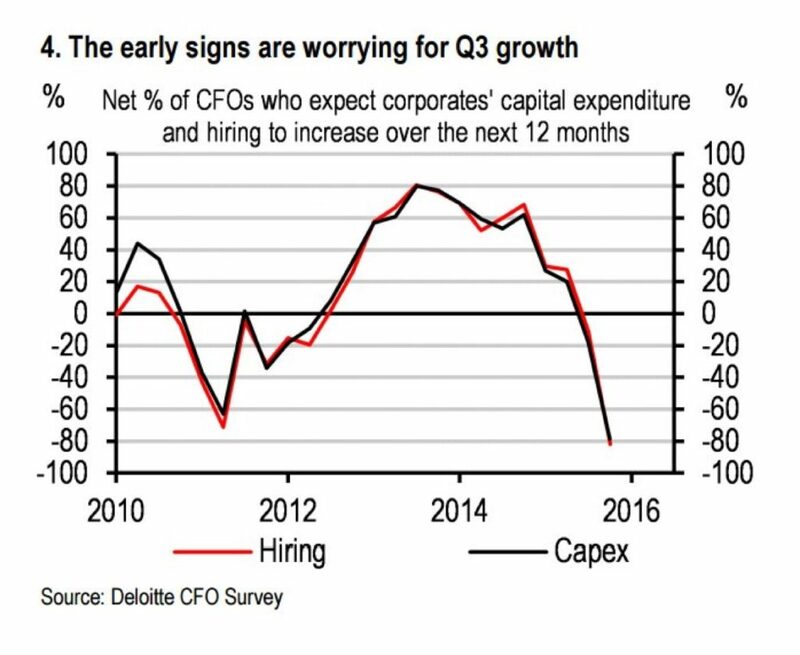 Once again, Capex (capital expenditures) was very weak, corporations remained concerned of investing amid shaky global demand. Non-residential fixed investment plunged another 2.2%, the third straight quarter in negative territory. Political uncertainty is putting substantial pressure on GDP. U.S. companies are frozen, an image of “deer in the headlights” comes to mind. Capex is the mothers milk to sustainable job creation, it’s just Not there. Looking out over the next 12 months, over 80% of CFOs say they do not expect to hire more employees or expand capex. In the battle of Fed branches, the New York Fed had Q2 GDP 2.2% while the Atlanta Fed had economic growth at 1.8%, both estimates are way off the economic reality. We must start to think about risk management and the 2016 election. In 2012, President Obama had GDP up near 4%, Hillary Clinton is looking at an average of 1% over the last three quarters. Gross domestic product rose at a 1.2 percent annualized rate after a 0.8 percent advance the prior quarter, Commerce Department figures showed Friday in Washington. The median forecast of economists surveyed by Bloomberg called for a 2.5 percent second-quarter increase. The Citi economic surprise index fell from above 40 to 16 on the Q2 GDP miss. Unanualized GDP grew 0.3% in Q2, in line Eurozone. Futures market now has the first rate hike “fully priced” close to December 2017, that’s using the mid range of the band. 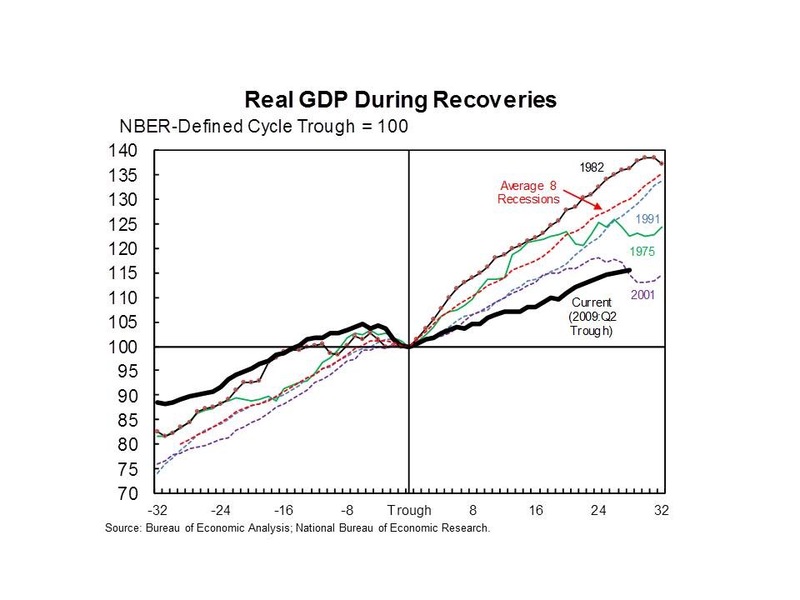 In Q4 of 2015, the Fed hiked rates into 0.9% GDP (Q4 QoQ real GDP). The media Fed dot (their expectations of the Fed funds rate) for December 2017 is up at 2.37%, a far cry from where the futures are. The U.S. economy has to grow above 4% in Q3 and Q4 to equal 2015’s 2.6% GDP growth. The two year U. S. Treasury has been the gift that keeps on giving, every sell off has been a buy this year. Fixed Investment dropped most in seven years. Personal consumption came in as expected, but the highest since Q4 2014. The ugly data Means Fed will keep rates lower for longer. Odds of December Fed rate hike are now at About 43%. Since Lehman, after nearly $25 trillion of U.S. stimulus we have an economy growing at 1.2%, that’s just 1/3 of the average annual economic output for the entire decade of the 90s. It’s more than interesting, the games China is playing with its currency ahead of important political gatherings smells to high heaven. As you can see in the chart below, when their bites get to large global stocks don’t like it. The S&P 500 dropped 13.5% two weeks after China’s first meaningful devaluation in years last August. It’s no surprise, the yuan mysteriously stopped a six-week run of losses just before Group of 20 finance chiefs get together in China’s Chengdu city July 23-24. There’s a Helicopter Coming, the only Question is Size. All lawyered up, Wall St. research has become group think gone wild. Analysts are terrified of stating their mind, opinion and the net result is one crowded trade after the next. In January, they lectured us in all the reasons dollar yen was heading to 125. By June, the same confused group was telling us she will finish the year near 100. Dreadful. 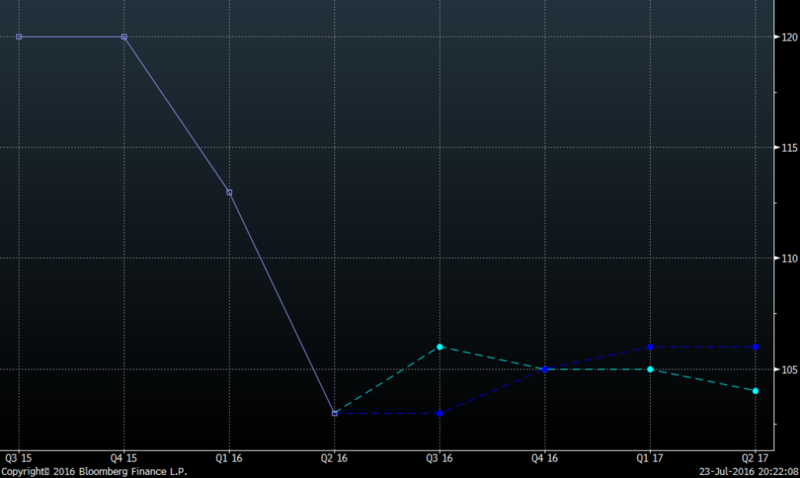 Do you expect helicopter money in the Next 12 Months? Dollar Yen Median 2016 Forecast from Wall St. Meticulously measuring market expectations is the key to trading stocks and bonds in a Mad Max world of central bank’s heavy hand influencing markets. We’ve stressed to subscribers in recent years, because of zero interest rate policy and negative interest rate policy, alpha is harder and harder to come by. We now live in a bizarre world where once “emergency measures” have become the norm. Crowded trades are littered across the field, beware of them. This week, we spoke to more than one hedge fund manager long U.S. stocks out of “fear of a daisy cutter” out of the Bank of Japan. Many professionals are buying stocks not based on valuation or earning outlook, but out of central bank worry (what might they do). The biggest fear is a large scale move by the BOJ that triggers a colossal short covering rally, leading to a blow off top. This Week’s Bank of Japan Meeting, How High is the Bar? Additional easing measures on top of further rate cutes are widely expected. Expansion of REIT purchases up to 170-185 billion yen. ETF purchases up to 7-5 trillion yen. Interest on Over Night Reserves cut to -20bps from -10pbs. New negative rates on existing loan support programs. The market expects coordinated release of fiscal policy guidelines of future stimulus. Kuroda (central bank chair) and Abe (Prime Minister) essentially acting as one. Late last week, Bank of Japan Governor Haruhiko Kuroda reiterated that the BOJ is ready to ramp up stimulus if needed. Dollar yen is up 7.5% from the Brexit lows as the market is pricing in some kind of helicopter. In the June – July time frame, international demand for Japanese products fell at it’s fastest pace since early 2013, the strong yen has crushed Japan’s global competitiveness. The early stages of Q3 have seen a lot of pain for Japan’s manufacturing sector as conditions worsened sharply. The BOJ has been making the point that there are different definitions of helicopter money. They’ve referenced direct underwriting of government debt by a central bank is prohibited in developed nations. BOJ has hinted a mix of both monetary and fiscal policies can boost the economy, and there’s nothing unusual in making that point. It’s as if they’re feeling out the market, trying to measure how far they might have to go. Stocks in Japan have surged as yen weakness takes hold, breaking out of a key technical downtrend. Japan’s virtuous economic cycle is continuing, capital spending is relatively solid, and Japan is in a gradual recovery phase but an aging population has been driving inflation lower. Central bank head Kuroda points out the uncertainty from Brexit won’t change the outlook for modest global economic growth I all likelihood. The Citigroup economic surprise index is at its highest level since January 2015, that’s the good news. Since 2010, Q1 U.S. GDP has averaged a touch better than a sad 1% growth, while Q2 has been coming in close to a robust 3%. Seasonal adjustments have been powerful and the key to bond trading and anticipating Fed policy moves has been found in surfing the waves inside these back and forth trends. Like clockwork, each year as we move from Q1 to Q2, Wall St.’s economist have been getting all beared up. They lower the bar so far down, only to be embarrassed once again by a powerful upside reversal. While Brexit has drifted somewhat towards the sidelines, the situation in Turkey represents a real European risk. As the situation has continued to escalate with president Erdogan taking extraordinary measures to restore his executive power, the market has punished Turkey’s current paradigm of chaos. President Erdogan just today announced a three month state of emergency. As we stated Friday night, we see significant and under talked about risks stemming from this crisis. The recent migration crisis from the Middle East into Europe has already posed issues with regard to domestic violence and increased entitlement spending. Considering the current budget deficits that exist in Europe, seeing another wave of migration, this time coming from a population center of 75 million people, would pose existential problems to European countries. By allowing commercial banks like Citigroup and JP Morgan to merge with investment banks, over $8T of customer deposits became directly exposed to another $78T+ derivatives and other 21st century financial products (CDOs, CLOs, SIVs, CMBS and more). Smaller investment banks without deposits were forced to lever up just to compete. From 2000 to 2008, Lehman’s leverage soared from 8-1 to 44-1. 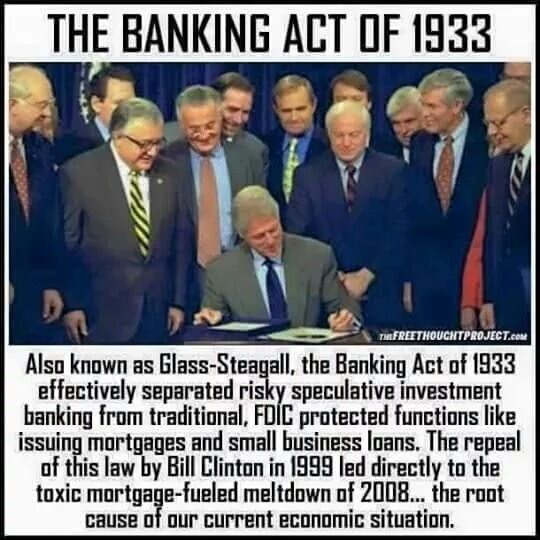 Calls to reinstate Glass-Steagall are now in both political parties’ platforms, as Bernie Sanders supporters succeeded in placing it in the Democratic platform over Hillary Clinton’s objections. 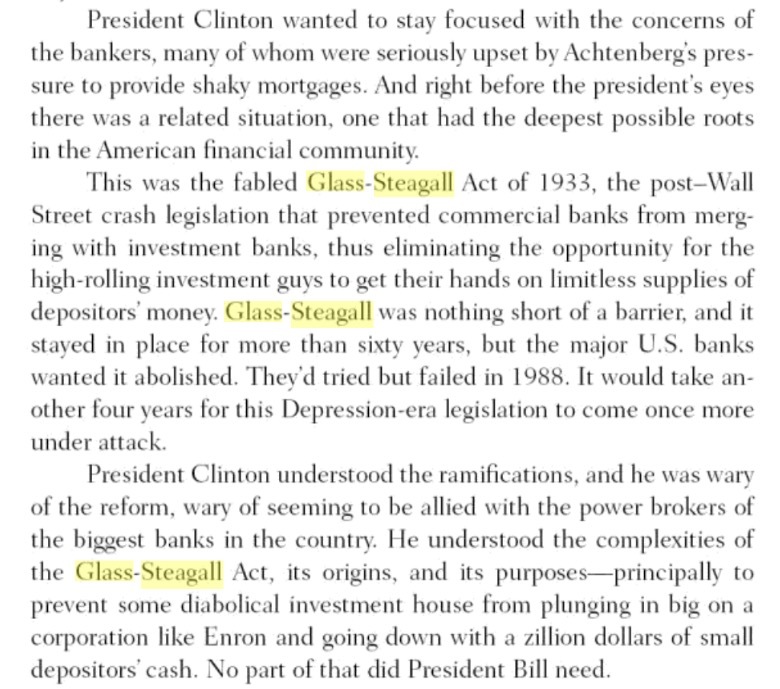 Yet actually reinstating Glass-Steagall is politically unlikely and pragmatically impractical. However, it foreshadows a path that Trump will take in the campaign which is likely to include repeated headline risk to large financial institutions. The Republican National Convention offers a plethora of prime-time speaking opportunities where anything can happen. Next week’s Democratic National Convention will feature a prime-time speech by Sen. Elizabeth Warren (D-MA) who has embraced reinstating Glass-Steagall and loves to attack Wall Street. Substantively, Minneapolis Federal Reserve Bank President Neel Kashkari continues to work on his own plan to end “too big to fail,” which may well include breaking up the big banks. Kashkari’s plan is expected to be released publicly in December, just in time for the next President, whether Trump or Clinton, and all of their nominees to be asked whether they support it. The Italian government is working on plans to set up a €50bn bad bank which would aim to clean up the country’s stricken lenders, the Sunday Telegraph reported. It is understood that €10bn of public money could be used to buy bad loans at a knock-down price, taking assets with a face value of €50bn off the banks’ hands, allowing them to start giving out more good loans instead. The scheme, which is being put together by JP Morgan, could help clean up the banks, but also puts the country’s authorities on a collision course with the EU, which does not want taxpayers bailing out banks before private investors take a hit. First, it will all depend on Monti dei Paschi and how much capital they need. Out of the nearly 400 billion dollars of NPL’s in Italy, Monti dei Paschi is responsible for nearly 40% of them. Second, a showdown between Italian State and the EU commission will surely come, we believe right after the 29th of July EBA (European Banking Authority) stress test results. This will be watershed moment for how Italian Banks capital requirements need to be addressed, if the number is too large and the Italian state cannot handle it, we will see renewed tensions as the ECB or Euro ﬁnance ministers will presumably have to step in. The third possibility is a solution outside the BRRD directive (Bank Recovery Resolution Directive, explained in detail below), a legal ﬁx, which would not require a bail-in is needed, to get an end around the legislation. The EU court case on the 19th of July looms large, EU law vs domestic law, one outcome would be a strong case to non bail-in solution, or an unfavorable outcome that bounds Italy to bail-in and the strict interpretation of BRRD. The Markit iTraxx Europe Senior Financial index comprises 30 equally weighted credit default swaps on investment grade European entities. We get from this that it is implausible that we will get any resolution before the July 29th stress tests. The market at the moment seems to be pricing in to much clarity into a situation that is anything but. Article 32 of the EBA (see below for explanation) and the BRRD makes it very diﬃcult for Italy to save its banking system without serious compromises. The BRRD is the key to bail-in life, and at this moment there is no reason to assume that this will be torn up. A couple weeks ago the ECB leaked a rumor with regard to the loosening of the capital key, if it became a reality, it would have positive ramiﬁcations for the Italian banking system. The ECB will not make a decision on the key before its next meeting (we believe capital key expansion rumors are far from reality, especially one year ahead of German elections). Ultimately, some sort of skirt around the BRRD bail-in laws, which Article 44 section 3 of the EBA allows, coupled with ECB involvement will occur; BUT working this out will take much more time and political tension than the market is currently pricing in.